UKIP Halesowen councillor, Stuart Henley, has completed a 145 charity cycle challenge to cycle from Barnsley to Amsterdam. Cllr Henley and his friend Bill Campbell raised over £3k for a prostate cancer charity with the overall total raised by the event coming to over £520k. The pair are already planning to repeat the event next year and are looking for sponsors. If you would like to help he can be contacted on stuartukiphenley@outlook.com. Theresa May has caved in to demands from the DUP for yet more English money to subsidise their spending in return for supporting the Tories at Westminster. Labour politicians up in arms about the £1bn bribe have short memories since it was a Labour government that introduced the Barnett Formula which guarantees extra spending per head of population in Scotland, Wales and Northern Ireland compared to England and successive Labour governments have used the Barnett Formula to buy Scottish and Welsh votes. 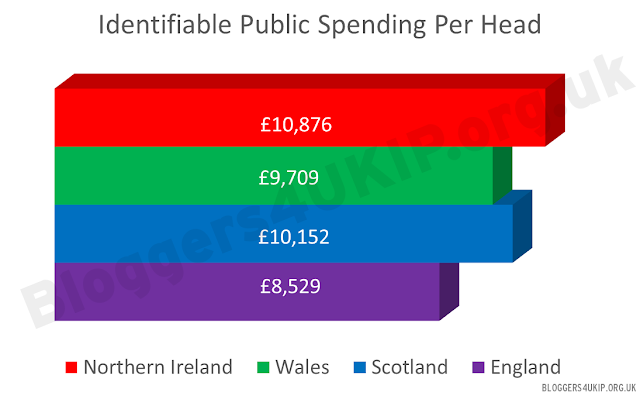 The Barnett Formula currently gives a subsidy of £1,623 per head to Scotland, £1,180 per head to Wales and £2,347 per head to Northern Ireland. This comes to £4.25bn for Northern Ireland with the Tories now promising to add another £1bn on top to secure the DUP's 10 votes. A Labour government introduced the Barnett Formula in 1979 which was conceived by Labour MP Joel Barnett (who now campaigns against the use of his own formula). Successive Labour governments have abused the Barnett Formula to buy votes in their former Scottish and Welsh strongholds. The Labour government led by Tony Blair introduced devolution for Scotland and Wales, deliberately leaving out England and successive Labour (and Tory) governments have blocked access to the minutes of the Cabinet meetings where that decision was made. Labour courted the DUP in both 2010 and 2015 with the offer of more money for Northern Ireland. Whilst still a Labour MP, Jack Straw said "the English as a race are not worth saving". Former (Scottish) Labour Lord Chancellor for England, Charlie Falconer, said that there would never be an English Parliament. Labour have consistently fought any attempts to give financial or political equality to England. The Labour Party never has and never will be the party that represents English interests. The same goes for the British nationalist Conservative Party. UKIP is the only mainstream party that is calling for an English Parliament, the abolition of the Barnett Formula and an end to the institutional discrimination against England. We are the only party that represents English interests and the hypocrites in the Labour Party complaining that the Tories are copying their ideas should hang their heads in shame for their past and present actions.